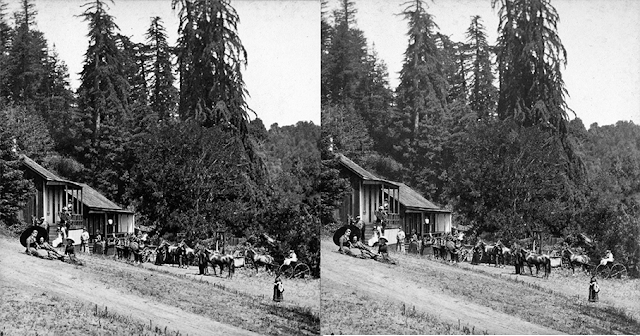 The Santa Cruz Mountains were the haunt of adventurers, rogues, and all manner of frontiersperson, but beginning in the 1870s, it also became a popular tourist destination. 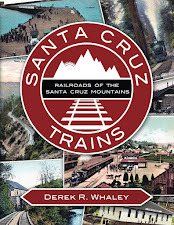 The arrival of the South Pacific Coast Railroad through the upper Soquel and Bean Creek basins signalled an important demographic shift from rural ranchers and farmers to small-scale tourism ventures in the mountains. Almost all of these ventures failed by the 1910s, when the railroad was outpaced by the automobile, but for nearly forty years, the mountains were alive with the sound of people enjoying their summer vacations along the untamed creeks, wild forests, and flowing meadows in the Glenwood and Laurel areas. Advertisements for local resorts across from the Glenwood railroad depot, c. 1905. 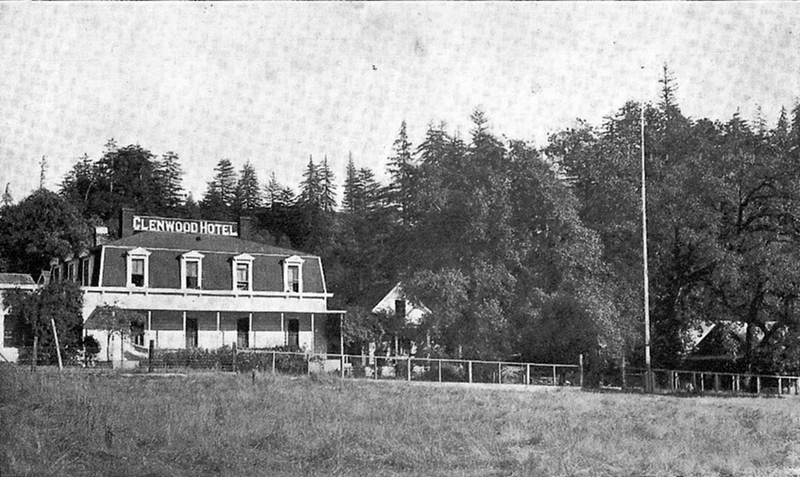 Accessible via a two-mile-long stage road from Laurel Station or via the San Jose-Soquel Highway (Soquel-San José Road), Hotel de Redwood was the only resort located above Soquel Creek and it was also the first built in the Summit area. Erected in 1851, possibly be E. Bowker, it original served as the owner's home, a general store, and a small hostelry for passing travellers. 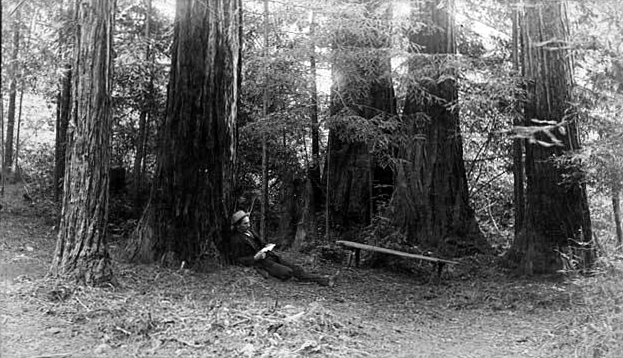 It was a unique experience since parts of the hotel were constructed out of living portions of redwood trees, as well as repurposed tree stumps. 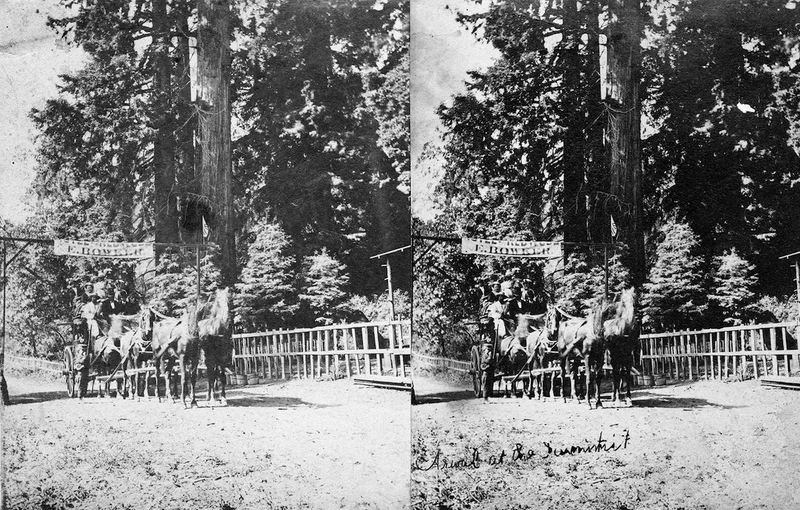 The resort lived up to the literal translation of it's name: "hotel [made out] of Redwood." 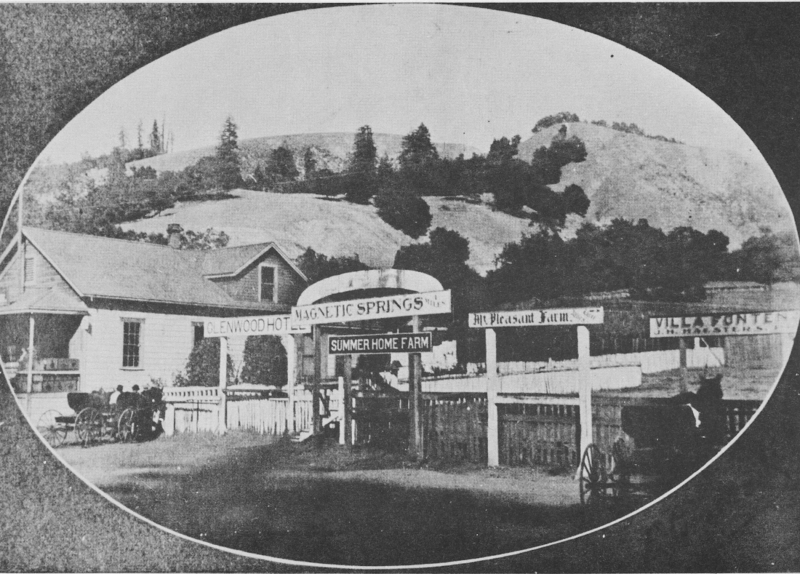 Early residents to the hotel enjoyed a nearby sulphur spring and went hunting in the woods or fishing along Soquel Creek. With the arrival of the railroad in 1880, interest in the resort skyrocketed, possibly buoyed by the fact that there were few other resorts in the mountains at this time. A post office arrived at Hotel de Redwood on June 3, 1879, and it remained there until October 16, 1882, when it relocated to nearby Highland (later Laurel). In 1884, Myron S. Cox purchased the resort and completely renovated it. He built a two-story structure with ten guest rooms and a balcony. The next year, the entire complex burned down. Cox rebuilt and by summer 1886, the hotel could support 110 people between the new primary structure and the adjacent tents and cabins. For the next fifteen years, the hotel thrived. In 1903, the hotel burned down again, this time under the ownership of a Mr. Fitzgerald. Although he rebuilt the hotel again, it was badly damaged in the 1906 San Francisco Earthquake, when the second story slid off and fell into Soquel Creek. New owners, Mr. and Mrs. A. J. Waltz, attempted to rebuild again, but another fire consumed their structure a short time after it was completed. They rebuilt for a fifth time and this structure survived the longest. Over the next thirty years, The Waltz family added a general store, cottage city, and a gas station for passing automobiles. However, the end of the rail line and the completion of State Route 17, both in 1940, signalled the decline of Hotel de Redwood. The ageing hotel struggled through World War II and the early 1950s before succumbing to yet another massive structure fire in 1953. Nothing of this century-long resort remains except a concrete gas pumping island and a location on maps entitled Redwood Lodge. 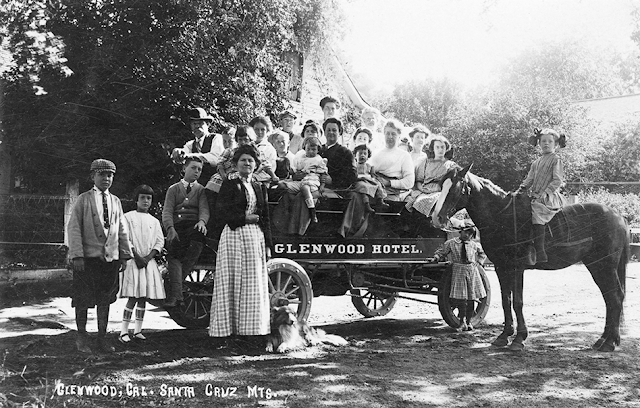 Often confused with the Glenwood Hotel, Glenwood Magnetic Springs was located four miles from the Glenwood train depot off Vine Hill Road near Scotts Valley. The resort was established by A. J. Haight in 1877 after a spring was found in the Glenwood Basin that apparently had strange magnetic properties a few years later. The Magnetic Springs spanned across 210 acres and included hotels and cottages totalling 40 rooms for guests. Vineyards and orchards occupied a quarter of the property and provided a secondary source of income for the owners. The most prominent feature of the resort, of course, was the magnetic spring, a famed hot or cold mineral bath that was thought to have curative properties. However, the resort also featured hunting, fishing, tennis, bowling, and a billiards parlor. The two-story hotel structure was called the Mountain House, although it was purpose-built for the resort. It featured a broad veranda which was popular with guests. 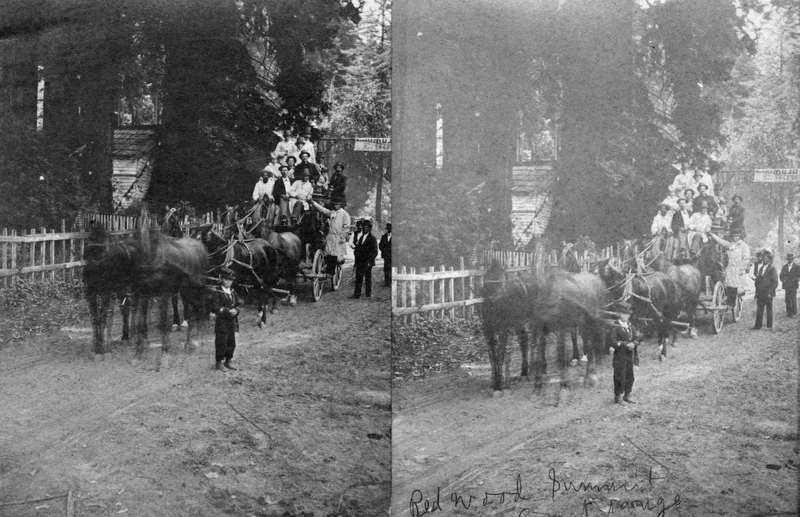 Visitors arrived at the hotel via a special horse-drawn bus that shuttled people from the train station. The springs passed through a variety of proprietors and owners over the years. In 1883, Hubert and Luff took over from Haight. In 1891, C. Lindsey ran the resort. In 1895, E. H. Lyon purchased the property and hired J. P. Stockwell to run it. By October 1898, Lajos V. Perhacs and his wife purchased the resort. When the Magnetic Springs shut down is not known, but it was at some point in the early 1910s, when the last advertisements and notices for the resort appeared in newspapers. By 1964, it had been closed for decades and all that remained was an old barn that sat on the northern side of Vine Hill Road in a grove of redwood trees. Named after John M. Bean's original farm which was built at the site in 1851 above the creek that also shares the farmer's name, Summer Home Farm was a purpose-built resort located along Bean Creek three miles to the south of Glenwood. Founded by B. C. Brown in 1882 on 300 acres purchased from J. W. DeWolfe, Summer Home Farm consisted of primarily a campground, a commodious hotel, and cosy cottages. He also seasonally dammed Bean Creek to create an artificial swimming, boating, and fishing lake beside the resort. However, unlike many of the other local resorts, Summer Home Farm remained a functioning farm throughout its time as a vacation spot. Brown planted new crops annually, including orchard fruits and grape vines, while maintaining a healthy herd of Jersey cattle. He even began experimenting with fruit drying in 1885. The resort was purchased by the Bernheim family before the summer of 1892 and advertisements for it disappeared from local newspapers. The Bernheims appear to have operated the location exclusively as a farm for the next five years as no information relating to its continued existence as a resort exists for this period. In 1897, J. H. Haesters took over as the proprietor and reopened the resort to the public. Like Brown before him, he continued to run the property as both a farm and a resort. The resort was sold again in 1900 to W. B. Hugus and Harry W. and Mulford Haines, who continued to operate it as before allowing Haesters to remain as proprietor. During this time, he expanded the dining room, added six new cottages, and added twelve new guest rooms to the main hotel. Haesters quit in 1902 to work at Villa Fontenay and Harry Haines took over as proprietor. Summer Home Farm survived in various iterations over the century. In 1905, the resort was leased by the New Thought ("Now") movement as a summer school venue. The movement turned the resort into "Now" Mountain Home, a health center and summer school venue for its members and interested visitors. By 1909, Summer Home Farm became the primary home of "Now." After the leader of the movement died in 1911, it is unclear if "Now" continued to run the resort, although it was certainly still operating and running advertisements throughout the 1910s. In 1917, the Haines are still listed as the owners, but no proprietor is stated. In 1919, George Reid took over as proprietor. After running the resort for over twenty years, Reid transferred his lease to the YWCA in 1941 for use as a women's summer camp, which ran for the next three years. In 1945, the Salvation Army purchased the resort for use as a boys summer camp and renamed it Camp Redwood Glen. The Salvation Army still owns and operates Redwood Glen Camp & Conference Center and the site can be accessed along Bean Creek Road. More information can be found at: https://campredwoodglen.salvationarmy.org. Located on the far side of the meadow above Glenwood, the Glenwood Hotel was the result of Charles Martin's entrepreneurialism. The first resort was actually Martin's original farm house. In 1883, he began expanding and upgrading the structure so that it could support up to 75 vacationers. This hotel opened in 1884. Eight years later, Martin began expanding his hotel into a full resort. Since he owned most of the Glenwood meadow, including either side of Bean Creek, he ran the creekside area as a picnic ground and dancing pavilion for passing trains. In 1892, he built a small cottage city on either side of the creek. Within a few years, he also redirected the creek into a concrete swimming tank, allowing for a pool of adequate depth for swimming in the summer. Beside the hotel, which was further expanded to support more guests, he constructed a baseball diamond and a small woodland theatre for summer plays. Unlike the other resorts in the area, the Glenwood Hotel was immediately accessible to railroad patrons since it was situated in town. A major fire in 1899 burned Martin's hotel and prompted him to rebuild it to contemporary standards. He erected on the hillside above the town a large two-story structure. This facility underwent further renovations throughout the next two decades, including the addition of electric lighting in 1920 and the painting of a cottage pink to designate it for honeymooners. The hotel remained under the control of Martin family, first by Charles then by his son William, throughout its existence as a resort. The resort underwent major refurbishment and upgrading in 1910. Management was taken over by P. D. and Florence J. Lowell in the mid-1910s. Glenwood Hotel in the field across from the Glenwood railroad depot, c. 1900. The Glenwood Hotel declined throughout the early 1920s, eventually closing in 1924. When the Great Depression set in, the resort property was repurposed as a camp for State Emergency Relief Administration (SERA) workers, who came to the area to upgrade bridges, roads, and other infrastructure. In March 1936, a Dominican group, Sisters of St. Mary's of the Palms, based out of Mission San José in Frémont, purchased the former resort for use a a summer boarding and day school. It opened the following year and was expanded in 1938 with further land purchased from the former resort. The main hotel structure was demolished sometime after 1969. Situated near Summer Home Farm, Mount Pleasant Farm was established in 1886 by William B. and Christina Knox. Compared to the other hotels in the area, very little is known about this small resort located along shady Bean Creek four miles south of Glenwood. The Knox family moved to Santa Cruz in 1919 and either sold or leased their property to Pirkut & Viunovich. The latter seem to have been actively logging some of the property in 1921 when a fire swept through and burned three of the guest cabins. In 1923, Edward McCarthy took over, but it is unclear whether he ran the site as a resort. The location is last mentioned in newspapers in 1941, when William Knox passed away. Christina had died in 1932 after a 20+ year ailment. Located off Vine Hill Road near the Magnetic Springs, Villa Fontenay did not begin its life as a resort. In 1879, French immigrants Henry and Nellie Mel de Fontenay bought the 250-acre property from John Jarvis, a local vintner who was seeking profitable locations to grow grapes. Throughout the 1880s, the Mel de Fontenay family grew grapes on their Villa Fontenay, introducing the first California vines of sauvignon blanc, sauvignon vert, and muscadelle de bordelaise. Henry eventually became the county's wine inspector and won awards for his grapes in 1884. In 1888, the Mel de Fontenay family completed construction of their large home but they were not responsible for converting it into a resort. 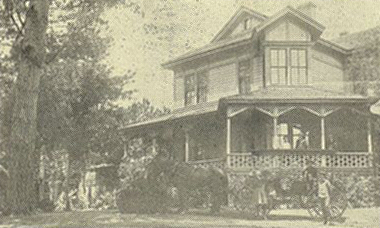 In 1901, Frederick W. Billing purchased the property. The house was enlarged and turned into a 14-room hotel, which featured a panoramic view of the entire Soquel Creek basin, with views of the Monterey Bay and Pacific Ocean. The property included large, eight-room cottages, which dotted the surrounding hillside. The initial complex included croquet and tennis courts, a bowling alley, and an amusement hall for billiards. Electric lights were installed across the facility for night-time events. Under the management of J. W. Haesters, who became proprietor of the property the next year, more cottages were added and the dining room and kitchen were enlarged to commercial standards. He also extended lighting along many of the surrounding paths. 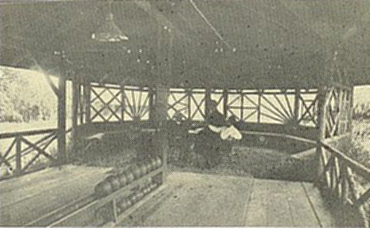 In Autumn 1902, Haesters added enough rooms to support fifty more guests, increasing the capacity of the resort to 150 vacationers, and in 1903 he added a second bowling lane to the alley. In 1904, following the death of Haester's wife, management of the resort was taken over by J. E. Moore. The next February, Billing sold the property to John A. Nordin, who hired Rice Harper as his new proprietor. Rice oversaw the addition of two large hotel annexes near the original Mel de Fontenay home. The resort remained popular for another five years, advertised in newspapers almost daily for much of this time. But beginning around 1911, the location dropped off as a resort and became more of a large country home that often welcomed large numbers of guests. At some point in the 1930s, Dr. A. T. Leonard purchased the property and used it as a private home. In 1958, the property was purchased by United Airlines for use as a seasonal employee recreation facility. In 1962, Cave Realty purchased the property and converted it into a housing subdivision. Later that year, the main Villa Fontenay hotel lost most of its roof in a massive wind storm, that led to its demolition shortly afterwards. Today, the Villa Fontenay area still goes by its historic name and is still used for wine-making, although there is no longer a resort of any manner there. Most of the region is populated by mansions with manicured lawns and swimming pools, thereby retaining its status as a beautiful haven within the mountains. Dunn, Geoffrey. "The Ghosts of Glenwood: The Little Town of Glenwood and Its Nearby Magnetic Springs were Once Major Tourist Attractions." Santa Cruz Style 24 (2013), 60-63. Gibson, Ross Eric. 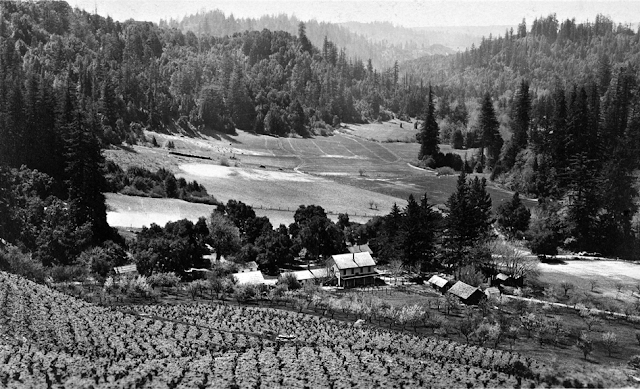 "A History of Wine Making in the Santa Cruz Mountains." Santa Cruz Public Libraries—Local History. Harrison, Edward S. History of Santa Cruz County California. San Francisco, CA: Pacific Press Publishing, 1892. Payne, Stephen Michael. "A Howling Wilderness: Resorts in the Summit Road Area." Santa Cruz Public Libraries—Local History. Thanks for the great pics. I'm not sure if you have all the facts right though. The hotel was long gone by 1964-it burned down. We are the owners of the old magnetic springs property. It's only 3 acres now but the barn is still standing! Barely! We live in the house that was the station agent shack or one of the cottages. Thanks for the info. 1964 was just the last year the newspapers had anything about the location, that's why I said it had been closed for decades by then. I couldn't actually find any information regarding its closure or fire. I did read about the barn, though, hence why I included that tidbit. Very cool that you live in the old station agent's house. I'd love to see photos. 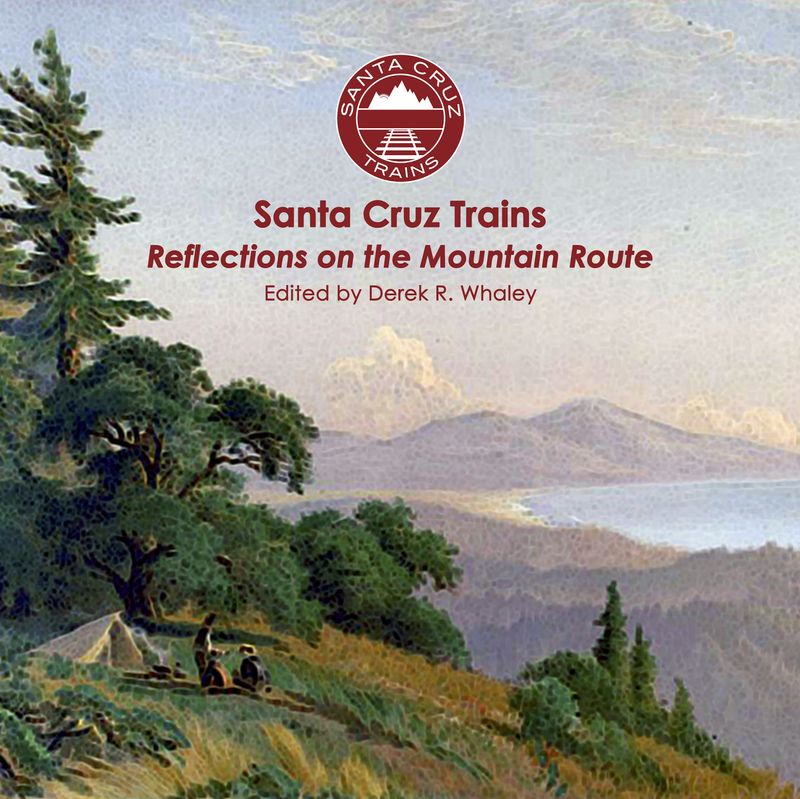 Please send them to author@santacruztrains.com. Really imaging writing on Laurel and Glenwood-Area Resorts. Such kind of blog really takes place on creating projects for my research as well. After reading out this post I got to know about the Glenwood Hotel (1884-1924) and Summer Home Farm (Camp Redwood Glen) (1882-Present) really helpful info for all. Also got some helpful information about the California County Park. Thanks for this wonderful creation.